Sometimes all it takes to have a healthier day is to start it out right with a healthy breakfast. It’s also helpful to have healthy snack options ready to go when hunger strikes. That’s why I love having a big container of FAGE Greek Yogurt in my refrigerator so I can use it for a meal or snacks. I think having Greek yogurt with fruit and toppings is the perfect way to start my day. Below I have some serving suggestions and 5 easy Greek Yogurt Bowls! 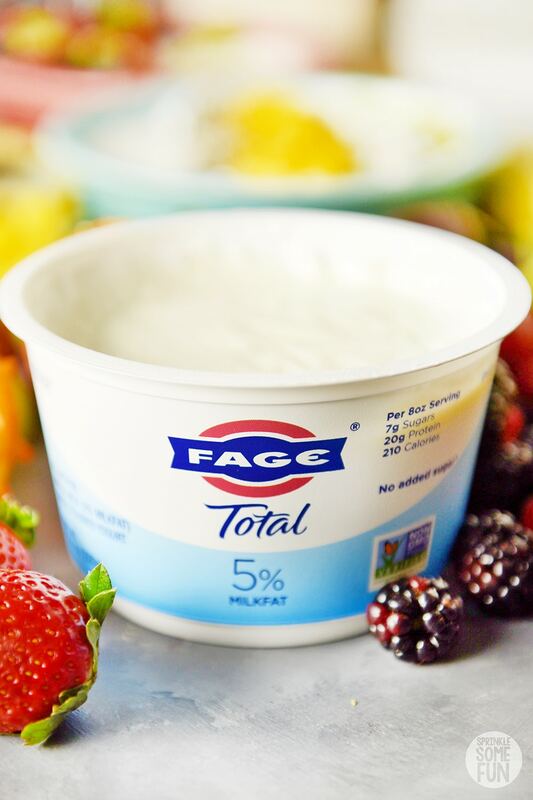 Have you ever tried FAGE Greek yogurt before? 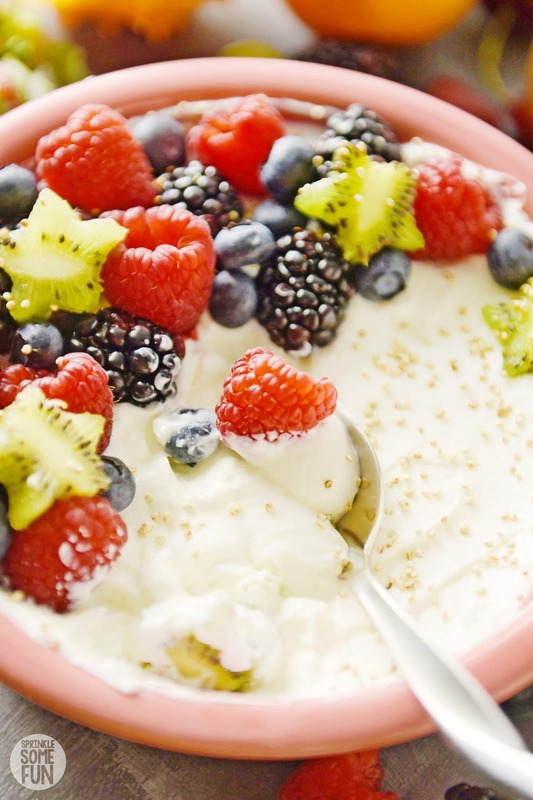 FAGE Greek yogurt is one of my favorite yogurts when I want something super creamy and filling. I love that FAGE has containers of 5% plain Greek yogurt so I can add in any toppings that I choose. You can find them at your local grocer in 3 different sizes; 7 oz., 17 oz., and 35.3 oz. It’s fun to mix and match fruits, nuts, seeds and granola! I like to add a touch of honey when I want my yogurt a little sweeter, but somehow I don’t even miss having sugar in the Fage Greek yogurt! Of course I am sure that you know that fruit and yogurt are great together, but there are some other yummy health foods I like to include too! Just looking at these yummy bowls makes me want to eat healthier all day long. Instead of cravings for junk food I have good cravings for these FAGE Greek yogurt bowls. 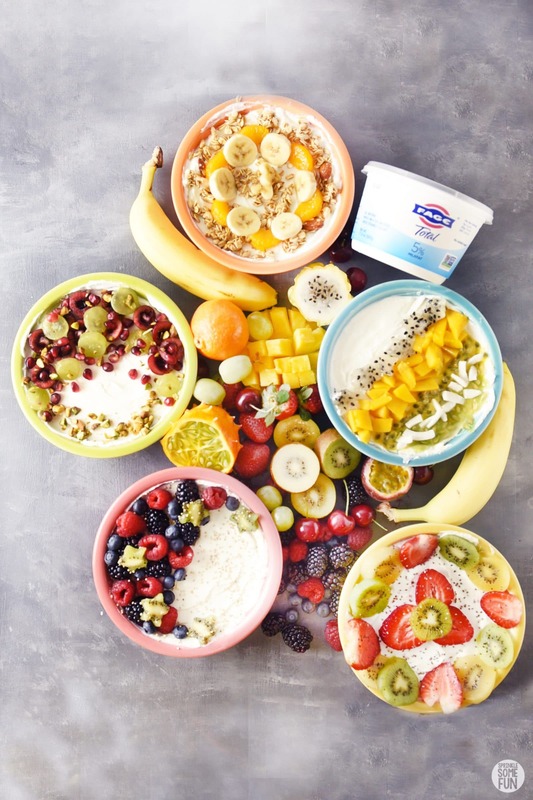 One great thing about Greek Yogurt bowls is that the options are endless! I’ve written down some of my favorite toppings so that I have written out below. Here is the list of my favorite toppings to add in a Greek Yogurt Bowl. Stone fruits: Cherries, Peaches, Apricots, Mangoes and Nectarines. Tropical Fruits: Bananas, Pineapples, Mangoes, Passion Fruit, Guava, Kiwi, Papaya, Dragon Fruit and Pomegranate. Berries: Strawberries, Blueberries, Blackberries, and Raspberries. Grains: Quinoa Puffs, Toasted Oats or Granola, and Puffed Rice. Seeds: Chia Seeds, Flax Seeds, Pumpkin Seeds and Sunflower Seeds. Nuts: Pistachios, Almonds, Pecans, Walnuts, and Cashews. FAGE not only has a delicious, creamy and distinctive taste, but it’s also All-Natural and Non-GMO Project Verified. It also has no added sugar (contains only naturally occurring milk sugar) and is protein rich. 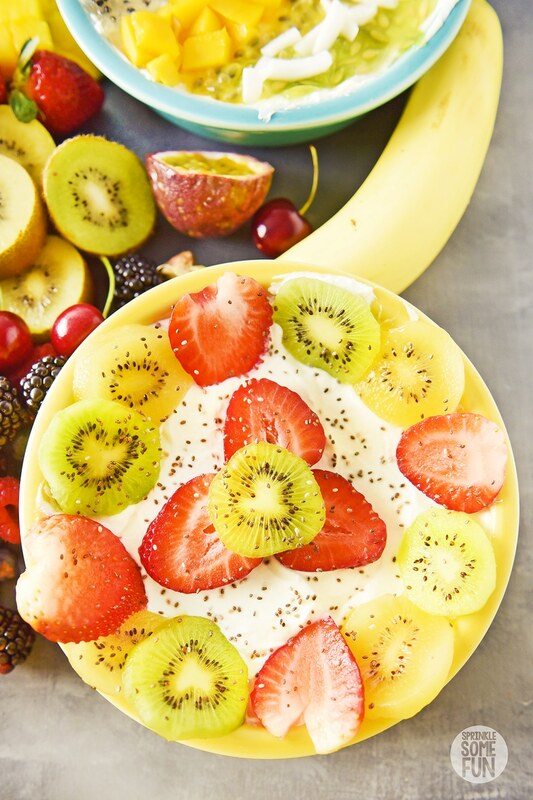 FAGE Greek Yogurt always goes perfectly with the fruits and toppings. Of course there is more that I could add to the list, but it’s a good one to keep handy when you need some Greek Yogurt inspiration! The way I use the list is to add a fruit or a couple of fruits first. Then add in a nut or seed. From there you can add a grain if you wish. Cherries, grapes, pomegranate and pistachios. Strawberries, green kiwi, yellow kiwi, and chia seeds. Mangoes, dragon fruit, passion fruit, horned melon and coconut. 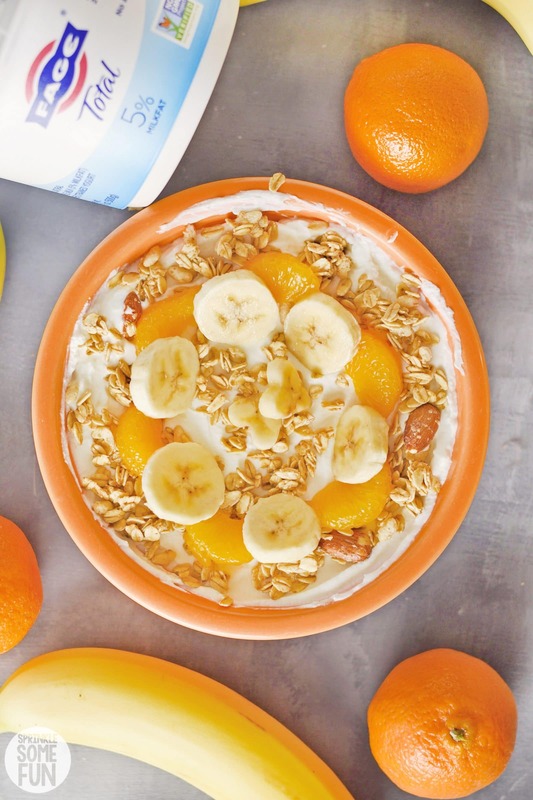 Granola, bananas and mandarin oranges. Blueberries, raspberries, blackberries, kiwi and puffed quinoa. 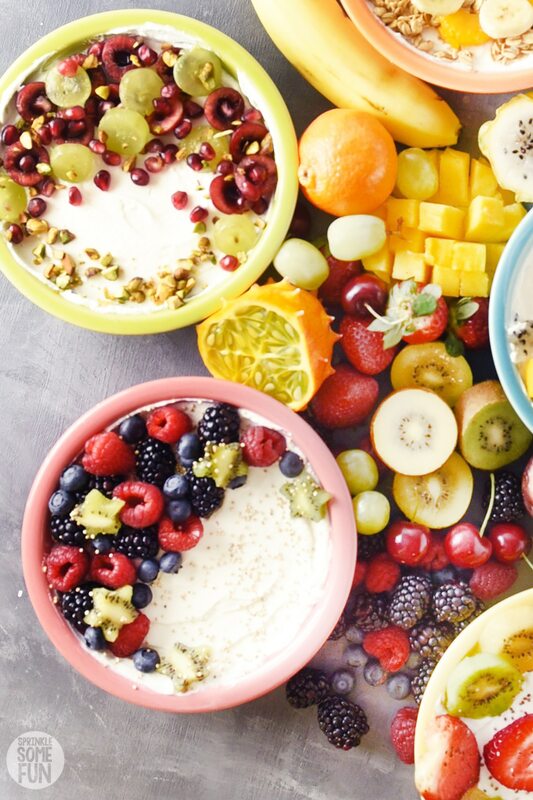 What do you like to add to your Greek Yogurt Bowls? If you haven’t tried FAGE 5% Plain Greek Yogurt as a yogurt bowl yet then give it a try and let me know what you think! 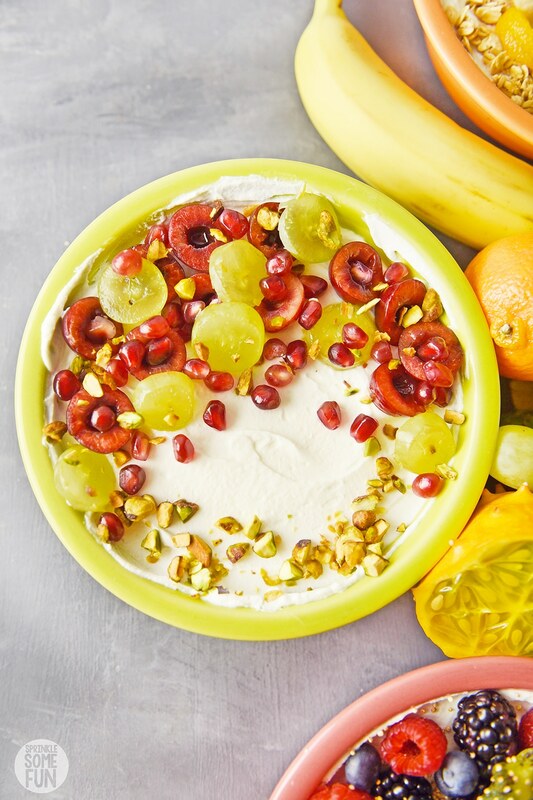 FAGE Greek Yogurt is something that I love to keep in stock for an easy Greek Yogurt Bowl anytime. I just loved it, I’m not only going to give it 5 stars out of 5. But, I’m going to share it with all my website’s followers on the social media. 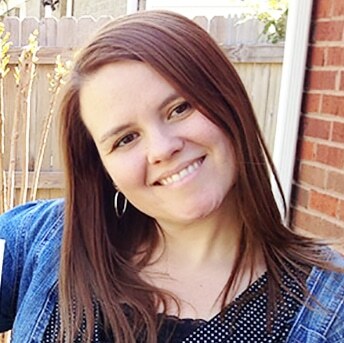 Thank you for giving me something useful to share it today! I had a greek yogurt bowl for breakfast! I love your presentation ideas though because mine was not as pretty! I want to do better with that so thanks for the inspiration.